In Queensland, Australia, there is a very special type of architecture which is a familiar sight on the landscape. This building type, simply known as a ‘Queenslander’ is little known outside of Australia but it shares architectural similarities with buildings situated much further away, for example the southern states of the USA. Common throughout Queensland and some northern parts of New South Wales, this article aims to bring knowledge of this special architectural style further afield to you, the reader. ‘Queenslander’ is a term which is regularly used to describe a particular type of building which is usually residential in function. There are many reasons for the construction of buildings in the Queenslander style, some of which we will be exploring at a later stage in this article. As a whole the Queenslander style is distinctive, however much like an accent it does vary from region to region. This is especially easy to understand when you consider that you could fit the British Isles into Queensland nearly seven times over. When confronted with a Queenslander you will recognise it instantly. These buildings are raised up on stilts and these serve a number of incredibly practical purposes. The building being on stilts allows the construction to take place almost anywhere, there’s no need to level out the ground in preparation for the foundations to go in. In addition to this ease of construction the stilts of the Queenslander allow for the passing of cooling air from the shade beneath the property, up through the floorboards and into the rooms of the house. Queensland experiences intense heat for many months of the year and this cooling feature was essential to the inhabitants of Queensland before the introduction of central air and air conditioning. Recent years have seen record amounts of rainfall hit Queensland. This heavy rain has brought with it unprecedented water levels and severe flooding in many residential areas of the state. At one point even the Brisbane River swelled beyond capacity and took over part of the city. The Stilts that a Queenslander features also aid in minimising the damage caused by flooding to a property in these fragile situations. All Queenslander styles incorporate a lot of planned outside space. Verandas are key to accommodating this space and are considered extending living areas of the main house. The Queensland climate makes verandas a key aspect of the comfortable living associated with the Queenslander. 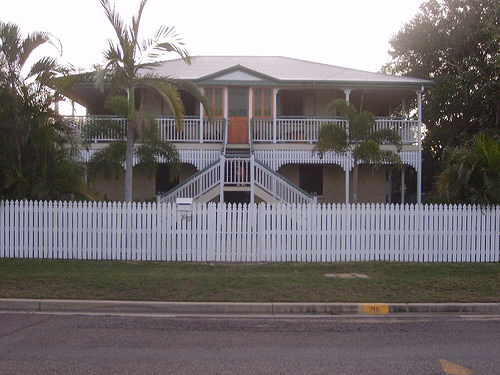 A Queenslander is usually painted a brilliant white, and their verandas and balconies are no exception. Quite often you will find Oak living furniture adorning the strips of veranda surrounding the house for use during the hot summer months. For an excellent selection of high quality and affordable Oak living furniture head to the National Furniture online store.